I don't know whether you're into Breaking Bad but a few days ago Anna Gunn (the actress who plays Skyler White) released a piece about what it's like to portray a character who's widely hated by the show's fanbase and how easily the lines seem to blur between character and actor--how people also hate her. I thought a lot about that while watching the first few episodes of DS9's seventh season. A couple weeks ago I attended the Las Vegas Star Trek Convention and sat in on the DS9 main cast panel. Each cast member took questions from the moderator but Nicole De Boer (who played Ezri Dax) began her answer with a sort of apology about how she almost didn't even feel like she belonged up there with everyone else--that the part she played was smaller etc. There's a lot of fan hatred directed at Ezri. People didn't like the fact that they replaced Jadzia; they didn't like the actress; they found her annoying etc. Here's the thing though, I actually really like Ezri. The more I watch her (especially at such a fast clip, all in order, which I'd never been able to do before) the more I like her. I think that if you're going to knock off one of your main characters in a senseless, less than honorable way, you'd better have something good in the works for her replacement. And I think they accomplished that with Ezri's entrance into Season Seven. She's awkward, unsure, and only wants to please. She didn't ask to be joined. She didn't undergo years of training and testing and studying in the hope of getting a symbiont. She was just minding her own business, serving as assistant ship counselor, when the Dax symbiont took a turn for the worse and absolutely had to take root in someone's gut right-freaking-then. Ezri just wants to belong. She wants to sort out her life and develop lasting relationships with people who she is strangely connected to. I get that. 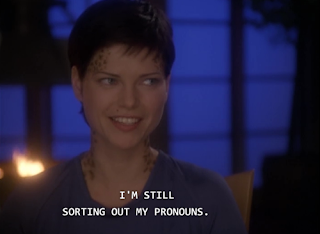 I've only got about 20 episodes of DS9 left and while I miss Jadzia, I'm happy to have Ezri around for the rest of it. I like Ezri better my second time around too.